A professional Graphic designer does not just offer graphics for print designs, graphic design encompasses website design, social media graphics, banner advertisements, Facebook cover page designs, Linkedin Hero images, etc. A professional graphic designer can do wonders for a blah Powerpoint presentation and create custom book covers or a professional speaker one sheet that your competition will drool over. Please take a moment to review our graphic design and website design portfolio. With every graphic design project a professional graphic designer brings a passion for the craft and a clear understanding of composition and professionalism. Professional graphic designers balance creativity with legibility and develop concepts in a style that captures attention and communicates the brand message. With over 20 years experience in the graphic design and advertising industry we have completed 100s of logos, posters, brochures, website designs and most every communication design item a company or organization could need – and we’ve won our fair share of awards along the way. The graphic designers at Connection Group are trained in electronic arts, and utilize the industry standard Adobe creative suite software programs. Proofs for all of our graphic designs are provided prior to publishing. Our customers own the full rights to the graphic designs products we create and once all items in a project are paid in full. All final graphic design files such as logo files can be sent to you in a variety of digital formats for use on the web and in print as desired. 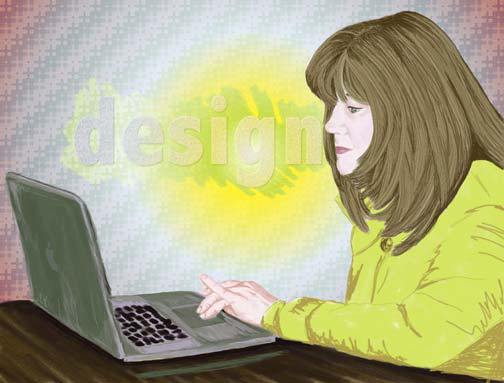 What does a Professional Graphic Designer Do? A professional graphic designer starts with a concept and consider images, type, shape and colors and how they will all flow together to communicate a clear message. Graphic design is also known as visual communication and communication design, it is the art of arranging type, form and image into clear and attractive items. Graphic design is not just confined to either paper or computer. However, trained professional graphic designer prefer to create on the computer for ease in digital file exchange as well as ease in workflow and technique. Using a combination of typography, visual arts and page layout, a professional graphic designer creates each graphic design pieces to clearly communicate the intended message in an attractive and memorable format. Our belief at Connection Group is that good graphic design doesn’t look like it has been designed! If a brochure looks as if it has been designed it has likely been over worked and has been built to impress the reader not to inform the reader. A professional graphic designer considers the uses for each design prior to determining which images, shapes, colors, type will be used. A professional graphic designer will also produce graphic design solutions that will be evergreen – not just a trending style that is quickly outdated. A professional graphic designer will create a fresh, custom, design that is unique to your company and can be used as branding visuals for many years to come. Connection Group professional graphic designers live in the Lansing Michigan, Charlotte, Michigan, Marshall Michigan and Grand Rapids, Michigan areas. We’re your selection for local graphic designers whether you are in Lowell, Michigan, Grand Ledge, Michigan, Tampa Florida, or Carlsbad, California we offer our expertise and talents to serve the good of all. Please connect with us today and talk about your visions, ideas and projects. We will gladly guide in the best direction for your success.